My work is dedicated to my beautiful Grandmother who went home to be with Jesus on Dec 5th 2006 from ovarian cancer. Pretty In Pink Happy Thanksgiving Card. 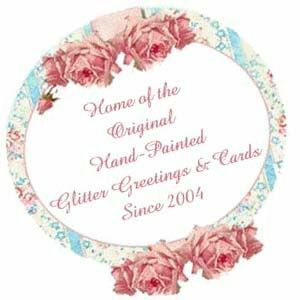 Hand Painted Cottage Pink Christmas Cards. Set Of 4 Cards. All Is Calm Hand Painted Card. Deer And Snowflakes Hand Painted Cards. Cottage Christmas Card. Hand Painted. Little Girls With Puppy Mother's Day Card. Happy Easter Hand Painted Card. Retro Pink Christmas Truck Card.